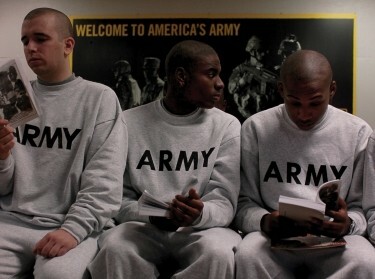 Who joins the Army, why do they join, and how satisfied are they with their decisions? The U.S. Army Recruiting Command asked RAND Arroyo Center to undertake research to improve its understanding of soldiers' motivations to join the Army, and how the reality of Army life matches up with expectations. Who joins, why, and how satisfied are they with their decisions? This study's portrayal of the U.S. Army private could serve as an educational tool for a variety of important audiences, such as Army senior leadership, junior officers, noncommissioned officers, and prospective new recruits. To conduct this study, RAND researchers interviewed 81 soldiers, ranked E-1 to E-4, generally assigned to their first Modified Table of Organization and Equipment unit. The findings from this study offer a rich description of experiences by a select few junior enlisted Army personnel; however, due to sample size limitations, the findings of this study cannot be generalized to the U.S. Army as a whole or to any rank or Career Management Field category. The research found that soldiers join the Army for family, institutional, and occupational reasons, and many value the opportunity to become a military professional. They value their relationships with other soldiers, enjoy their social lives, and are satisfied with Army life. The importance of family is a recurring feature in the narratives of soldiers. Soldiers cite call to serve and perception of honor, but also thirst for adventure, benefits, and pay. Most soldiers in the research sample acknowledged the unique benefits that they got from Army service. Despite generally favorable experiences overall, soldiers are frustrated by the bureaucratic characteristics of work in the Army. The information soldiers consume prior to joining their first unit may influence expectations about Army service; more accurate information than that derived from action movies might improve satisfaction with their real experience. The critical importance of camaraderie and good small-unit leadership suggests avenues to enhance soldier recruitment and retention. Most soldiers in the research sample said that their leadership and peers were an important source of support. In fact, leadership and fellow soldiers were cited as the most important source of motivation, camaraderie, and overall social support. A variety of factors affect soldiers' intent to reenlist, such as family concerns, injuries, promotions, civilian opportunities, and the likelihood of deploying to war. The majority of soldiers believed their Army service would help them find future work. Consider emphasizing occupational benefits and adding social bonds to the current Army Value Proposition (AVP). Highlight social bonds as part of reenlistment campaigns. Consider incentivizing first-term soldiers who successfully recruit from their friends and peer networks. Ensure recruiters provide accurate information about military occupational specialties. Improve the accuracy of information about Army life that new recruits receive. Following Basic Combat Training/Advanced Individual Training and One-Station Unit Training, provide accurate information about installations and unit assignments. Maintain or expand recruitment programs that build parental support. Help leaders engage soldiers in relevant and educational tasks and otherwise use soldiers' time more effectively. S. Rebecca Zimmerman @_rebeccaz, Todd C. Helmus @Helmus, et al. The research described in this report was prepared for the United States Army and conducted by the Personnel, Training, and Health Program within the RAND Arroyo Center. Helmus, Todd C., S. Rebecca Zimmerman, Marek N. Posard, Jasmine L. Wheeler, Cordaye Ogletree, Quinton Stroud, and Margaret C. Harrell, Life as a Private: A Study of the Motivations and Experiences of Junior Enlisted Personnel in the U.S. Army. Santa Monica, CA: RAND Corporation, 2018. https://www.rand.org/pubs/research_reports/RR2252.html. Also available in print form.